How cute am I eh? All the various Hyena species are hunters and scavenger that are known for their fossicking and foraging on the African plains, preying on the sick, dying and the leftovers of lions. One species of hyena, the aardwolf, however, eats termites! Hyena are known as the dirty dogs of the animal kingdom. 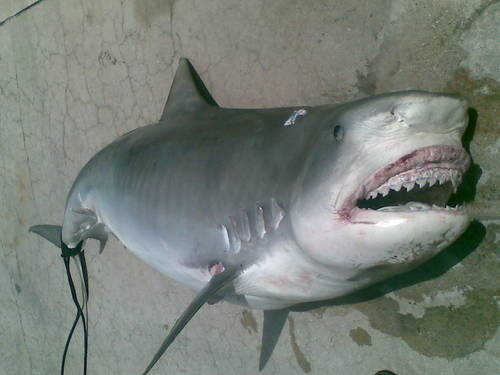 They have extremely strong jaws in relation to their body size and have a very powerful digestive system with highly acidic fluids, making them capable of eating and digesting their entire prey, including skin, teeth, horns and bones. Hyena have a poor reputation. 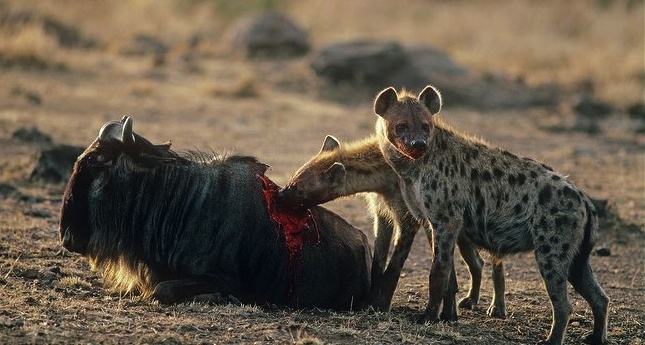 Let's just say the bad light that hyena were portrayed in The Lion King was nothing to their real world savagery. 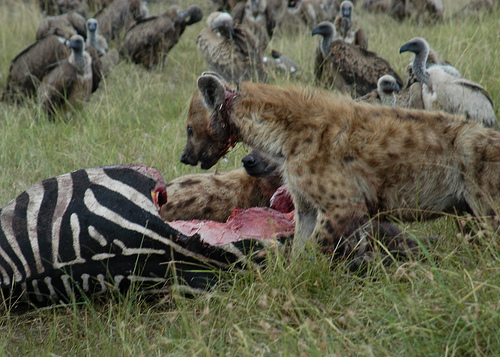 You can almost guarantee this zebra was not taken down the the hyena pack, note the pecking order - lions first, hyena next and then the Carrion Cleaners of Africa, the ever hovering vultures. A blog that features a post debunking the top ten animal myths goes on to perpetuate the myth that the spotted hyena lives off the leavings of lions? Yes, hyenas are opportunist carnivores, but so are lions—and guess who's the more successful hunter? 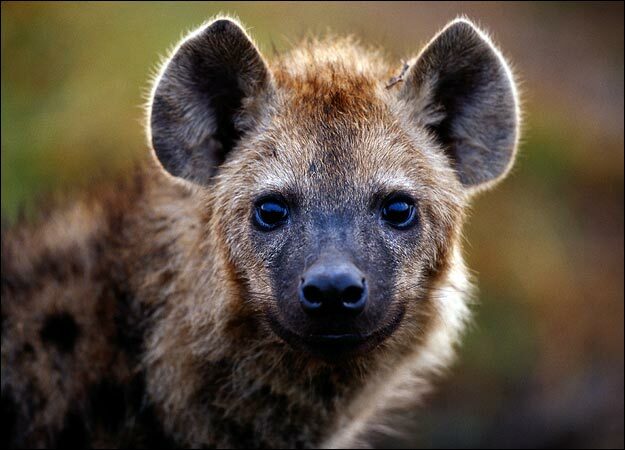 It's the hyena, bringing down an average of 60% of all its prey compared to the lion's shockingly low 30% average. So no, it's anything but certain that lions brought down the zebra in that last shot. 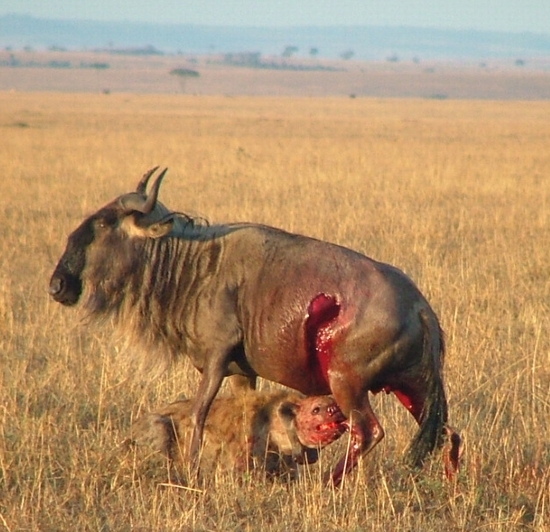 If anything, lions and hyenas in an uneasy stand off over a kill means hyenas brought it down and the lions are there to poach it. Nor is this something that's only been discovered with the advent of advent of super low-light imaging technology to follow spotted hyenas at night. The first major report this fact is Hans Kruuk's (now out of print but still available used) _The Spotted Hyena: A Study of Predation and Social Behavior_, first published in 1972. As long as we're taking on myths, yes, rapid disembowelment, the kill method used by hyenas and the painted dog, is a horrible and painful way to die. 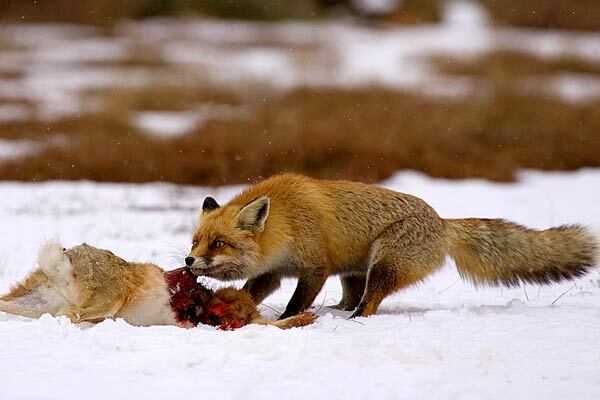 But it's always fast: depending upon how fast predators eat—and the spotted hyena and painted dog both eat very fast—prey is within ten minutes. Compare that with the suffocation method used by the slow eating big cats, most especially the lion, who'll just lick its prey like a lolly pop interminably : it frequently only renders its victim unconscious, causing the prey to awaken later, in pain and being eaten in a way that will maximize the duration of its agony. Thanks for stopping by Bud. 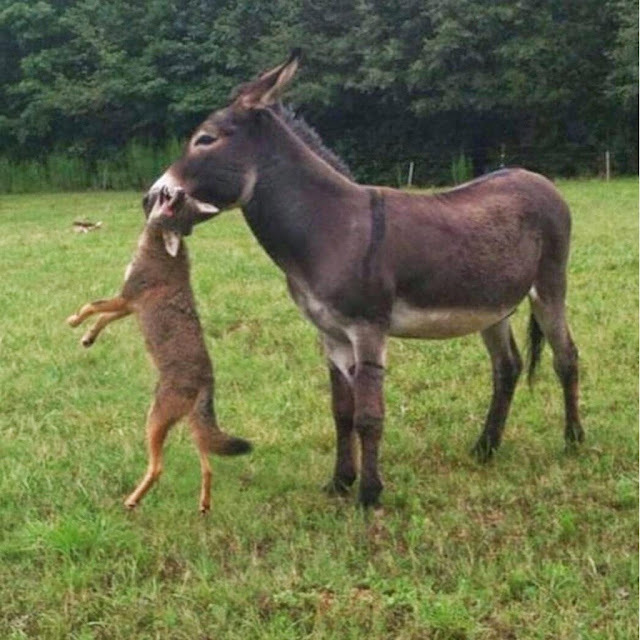 You raise some fair points however this site needs to be taken with a grain of salt, it's fairly irreverent to the actual realities of the animal kingdom. OK, I looked around and...gosh, don't I feel the pedantic chump. Sorry folks. I enjoy images of animal predation very much, ever since I had a tiny pet frog that I had to feed live crickets. I found myself taking my frog's "side" against the crickets, as if they were disgusting vermit that needed to be wiped out; discovering that crickets were disgusting insects who were cannibals and practiced copraphagy reinforced this. A friend who got an aquatic turtle he had to feed live goldfish reported having the same sentiments. French photographers Christine and Michael-Denis Huot have been following and photographing animals in the wild for many years, but—at least as of the time these photos were taking, 2010, I believe—had not seen anything so casually brutual. Photos of the incident start here, and their narrative of what transpired and events leading up to it (translated by Google) is here, and the last we see of the newly tenderized cub is here. Unfortunately, the narration of the video at http://www.youtube.com/watch?v=E4kYTaXpye0&feature=plcp is in Japanese. Based on the images, the lioness moves her cubs to protect them from the elephants in the area, but one suffers a spinal injury that renders it unable to move its hind legs, and so she euthanizes it by biting off its head—but then takes to licking its headless body as if it were a lollypop.